Today advanced (non-food) biofuels do not yet significantly contribute to our energy mix. But energy scenarios predict they will contribute over 1 EJ/year in 2030. By 2050 their projected share of the total global energy market in EJ/year is expected to be almost 10% of that of crude oil. Syngas production from FPBO and subsequently synthesis to a transportation fuel. Hydrodeoxygenation (HDO) of FPBO to produce an oil refinery compatible feedstock or final biofuel. There is a third route to producing advanced biofuels that takes the crude FPBO and leverages existing refineries. As Brazilian oil major Petrobras and others have recently demonstrated at scale it is possible to co-process crude FPBO in existing oil refineries into gasoline and diesel. 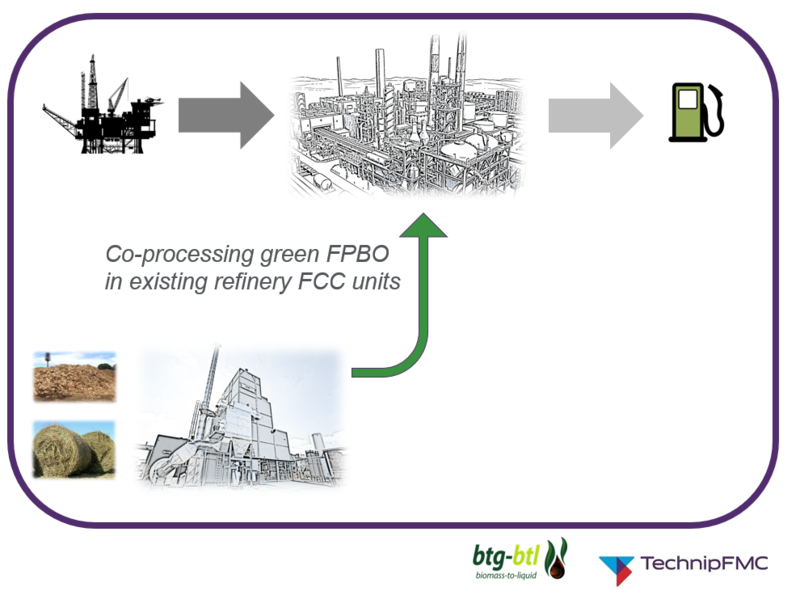 BTG-BTL is currently working with multiple international stakeholders to make FCC co-refining of FPBO a reality. In 2016 BTG-BTL signed an exclusive cooperation agreement with TechnipFMC. TechnipFMC licenses Fluid Catalytic Cracking (FCC) technology and is developing a route to co-feed FPBO into existing refinery FCC units. This approach will enable the refining industry to produce biofuels and high-value biobased chemicals in an increasingly renewable way without having to change the current infrastructure of their plants.